One of the most fantastic experiences in Dzanga-Sangha is the possibility of any tourist to be within meters away of wild gorillas as they go through their daily lives in their natural habitat. This is not only a unique opportunity for tourists, but the activity also brings benefits to the local communities, who play a crucial part in the tracking and habituating the animals to human presence. How can you sit side by side with a 200kg gorilla with no problem? Well this is not an easy task and certainly not something that happened over night. This is possible due to painstaking efforts on the ground. Since 1997, WWF has supported the Dzanga-Sangha Primate Habituation Program in its efforts to develop ecotourism through gorilla-viewing. and, the long distances traveled by western lowland gorillas as they search for fruit in the forest. This is where local knowledge comes to play a crucial role. 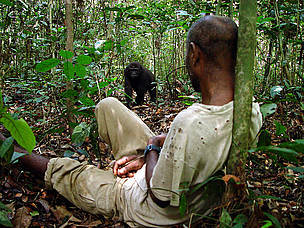 The strength of the program is in the hands of the famous BaAka (pygmy) trackers. The BaAka (pygmy) people know their homeland by heart and their ability to locate the gorillas comes from this profound knowledge of the forest. Some of the traces they follow are so elusive that, to inexperienced observers, they can be difficult to recognize even after they’ve been pointed out. With the BaAka’s skills the search for gorillas was has been successful and contact with gorillas frequent. This meets one on the main goals of the Dzanga-Sangha Primate Habituation Program, which is to generate income for conservation and the socio-economic development of the area. Gorilla tourism at Dzanga-Sangha opened officially in 2001, after the first gorilla family was habituated to human presence. Habituation is the process through which wild animals slowly accept human observers as neutral elements of their environment. The process is generally achieved through a series of repeated encounters. The Makumbas’ range in an area of 20-25km² south-east of the base camp called Bai Hokou. From here, everyday a team from the Primate Habituation Program leaves early in the morning to follow the gorillas from their nest until noon, when a second team leaves camp to take over the watch. The gorillas receive close to 400 visitors a year. Group Makumba’s habituation started in 2000. Today the group is known worldwide thanks to its several appearances in wildlife documentaries, newspaper reviews, scientific literature and the stories told by each visitor who have had the chance to meet these gorillas in the wild. Makumba has completely accepted human presence around his group but he will still bark at or charge visitors if he feels they are being too noisy or getting too close to his family. Makumba he has been the leading silverback of his group for at least nine years. Rangers think Makumba's is in between 24-27 years old. Makumba earned his name from his tendency to sprint away at the slightest sound of approaching humans, sometimes even leaving the rest of his group behind (a behavior rare among silverbacks, who generally take the charge of defending their group). Today Makumba is a confident male who has completely accepted human presence around his group. This said, Makumba will still bark at or charge visitors, especially if he feels they are being too noisy or getting too close to his family. Under these circumstances, of having a 200kg silverback rushing at you, it is best to stay still, avoid eye contact and show acceptance of his obviously higher rank. Although it is very difficult to estimate his age, there are a few clues: he has been the leading silverback of the group for at least nine years now and silverbacks, on average, reach sexual maturity and are able to lead a group at about 15-18 years old, therefore, Makumba is probably at least 24-27 years old. Bombe is the largest of the three females and owes her name to a large, round fruit found in the forest. Malui gets her name from her protruding ears. "Malui" is the BaAka word for "ears". There are currently three females in Makumba’s group: Bombe, Malui and Mopambi. All three females have given birth to three surviving offspring from 2001-2008, which is quite an exceptional reproductive success! To the experienced observer Bombe, Malui and Mopambi are easily distinguishable by their physical traits as well as their characters, which make them three very distinct individuals. Western lowland gorilla females are often found spread apart, feeding at quite a distance from the silverback, the juveniles and females with newborns. After giving birth, females are more frequently found in proximity of the silverback, seeking his protection. Females’ reactions to human observers are a rather individual matter: some gain confidence pretty quickly while others never fully accept their presence. She has been the most difficult female to approach, as she would scream and charge the observers with the same audacity of a silverback. When not in the mood to charge herself, she was particularly skilled in eliciting Makumba’s reaction towards the approaching humans. Bombe has gradually seemed to understand the harmless intentions of the habituation team and today will mostly ignore them or just move off a short distance. A protective mother, she keeps a constant eye over her youngest infant, Mobangui. Her oldest offspring, Silo, at the age of 7-8 left the group after an interaction with another gorilla, in late 2007, however the juvenile Essekerende is still part of Makumba group. Malui owes her name to the BaAka word for ears, because of her protruding ears. However, the trait which quickly identifies her is her nose print, its distinct T-shape is also noticable in her offspring. In 2007, Malui was the first western lowland female to ever be observed giving birth in the wild. Malui or made a nest at about 15m height in a fruit tree and gave birth to Mowane. The silverback was in the proximity feeding on a tree and a few of the juveniles were watching the event closely from close by. All three of Malui’s offspring (Mowane, Mossoko Abuli and Mio) are still in the group. Mopambi has a shy but very gentle nature. She is smaller and more slender than the other two females, Mopambi is also identified by her very skinny face and a missing toe in the left foot. After the birth of her last infant, Bokata, in 2006, she mostly hangs out near Makumba, together with her daughters, the oldest Etefi (who emigrated to another group in late 2008) and the juvenile Mai. Bokata riding on his mother Mopambi's back. Infant gorillas are dependent from their mothers for food, transport and protection until the age of four. Mobangui is the son of Bombe and was born in July 2007. Infant gorillas are dependent from their mothers for food, transport and protection until the age of four. Their buttocks have a typical tuft of white hair which makes them easily distinguishable and likely elicits protective behavior from the group’s adults on their behalf. Although they are generally found in direct proximity to their mothers, infants are very active during play sessions, especially when the rest of the group is taking the mid-day nap. The three infants in group Makumba, Bokata, Mobangui and Mowane, were born from females already habituated to human presence so they are extremely confident around people, to the point of occasionally attempting to play with them. This is always discouraged, generally by moving or turning away from the gorillas, to avoid close contact and the risk of disease transmission. Bokata is the son of Mopambi and was born in January 2006. Like his mother, he is rather slender and long-limbed, with sparse hair. He was named after a white mushroom, from his very pale looks at birth. Bokata is by far one of the strongest characters in the group and spent much of his second year attempting to be bipedal! Mobangui is the son of Bombe and was born in July 2007. He is rather round like his mother and has thicker and fluffier hair than Bokata. Mobangui was named after a vine fruit. Mowane is the youngest gorilla in the group, born in December 2007. Named ‘gift of God’ by the CAR Minister for the Development of Tourism and Handicrafts, he is nicknamed Tembo, after the tree in which he was born. Essekerende is about six years old and is often seen mimicking Makumba, the silverback leader. Mai, whose name means "water," has a gentle and quiet temperament and is often seen carrying her little brother Bokata around on her back. Mossoko Abuli spends most of his time eating and following around his father, Makumba. Juveniles are young weaned gorillas, between four and seven years old, who may occasionally still suckle or ride on the backs of their mothers, but otherwise are independent for both food and transport. Although juveniles may spend quite some time in proximity of their mothers, they gradually tend to spend more and more time together, following the silverback. It is quite a sight to observe a majestic 200kg silverback walking across the forest, followed by 4-5 playful juveniles, trying to imitate his postures and gestures (and keep up his pace!). Juveniles love making noise, especially when observed: they will stand upright and clap their hands, beat their chests (but more frequently their bellies!) and make all sort of display and chase games. When crossing rivers, they enjoy many water games, including splashing and water drumming. Their curious nature allowed for their quick habituation, even when their mothers were still reluctant to accept human observers. Essekerende, named after a forest fruit, was born in 2003 and has an instantly recognisable body profile; he has a large round belly, a small round head and short relatively stick-thin limbs. His face is covered with character-giving lines and he has a nose not unlike his mother’s, Bombe, and older brother’s, Silo, but with an even more obviously flat and wide shape. His hair is fluffy and messy, and has a reddish tinge. He is a confident, easy-going and inquisitive individual, not in the least concerned with the presence of observers. He is fully independent from his mother and is most often found on his own or following Makumba’s shadow. He shares with his mother a passion for food and is always seemingly chomping down on fruit or termites. Mai was born in 2003 and like her mother, Mopambi, and her older sister, Etefi, Mai has a slim, graceful build, with long slender limbs. She has a distinctive nose, which is long and straight with parallel lines across its bridge and with close-together nostrils. Mai, meaning “water”, has a gentle and quiet temperament. She often attempts to play with anyone and everyone around her, but if no-one responds, she is quite content to amuse herself with chest beating and solitary play. Lately she has spent a considerable amount of time with her younger brother Bokata, often carrying him around on her back. Mossoko Abuli, which means "big head", was born in 2004. His named "big head" because when he was young his head seemed out of proportion to his small body. He has very dark, thick hair and a round belly, which gives him the impression of waddling rather than walking. Like is older sister, Mio, he is developing a deep line on the bridge of his nose. He is the smallest independent individual in the group and retains the white 'tail' of newborns. Mossoko Abuli has a serious air, often too occupied with filling his belly than with play. He spends the majority of time with his father, often seen trailing behind Makumba’s heel and quickly following when Makumba decides its time to move on. Mio is usually found be her mother Malui's side and is always attempting to carry, groom and play with her little brother Mowane. Rangers think Kunga was born in 1999 before the group was habituated to human presence. Kunga got his name from the thick, dark hair that covers his body. "Kunga" means "hair" in BaAka. Subadult gorillas have slender bodies and although much smaller than adult individuals they are independent from their mothers in every aspect of their daily activities. It estimated that a western lowland gorilla female is a subadult between the ages of severn to 10 and an adult female from 10 on. The physical and sexual maturity of males is slightly different, as from subadult they will turn blackbacks. Males in this category are similar in size or larger than adult females but with more developed musculature. Mio is the oldest daughter of Malui and shares her mother's line-shaped nose print. "Mio" is, in fact, named after the BaAka word for nose. Her estimated birth year is 2001, making her a young subadult. She is often seen at her mother’s side, especially since the birth of her youngest brother, Mowane, whom she frequently attempts to carry, groom and play with. Kunga was probably born in 1999, before the group’s habituation started. He is thought to be the son of a female who emigrated to another group in 2006. Kunga means "hair" in BaAka and he is named so because his body is covered with thick dark hair. Kunga’s behavior frequently shifts from a serious silverback-imitating attitude, displaying the typical adult male strut-walk and acting protectively towards his group members, to being boisterous and playful with the other juveniles and infants and even Makumba himself.